TAKE CARE NOT TO DEFLATE THE BALLOON DURING DISCONNECTION. If this occurs re-inflate the cuff. If cuff pressures are equal to the recommended level and an air leak persists, medical advice should be sought before any further air is inserted into the cuff. The cuff pressure should be checked twice daily with a pressure manometer and maintained between 15-30cms H2O. Higher pressure than this may cause tracheal mucosal damage. Too little pressure may mean that the cuff fails to achieve an adequate seal against the tracheal mucosa and the patient is at risk of a severe air leak developing causing hypoventilation. 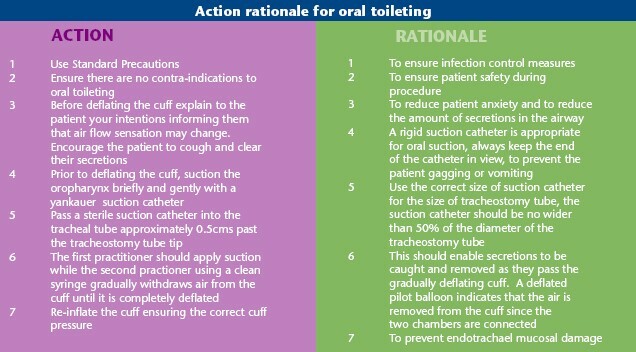 Although the cuff does not prevent aspiration occurring, an adequate seal may minimise the associated risks. Appropriate management of a cuffed tube can prevent damage to the tracheal mucosa, which at a later date may result in tracheal stenosis. High volume low pressure cuffs will minimise trauma to the trachea. NB: An estimation of cuff pressure by squeezing the external pilot balloon or filling until no air leak is heard (if not using stethoscope) is not recommended (Adam & Osborne 1997, Dikeman & Kazandjian 1995). Always use a stethoscope, do not depend on normal hearing. If you are unsure use a cuff pressure manometer to check pressure. Do not exceed the manufacturers recommended cuff pressure. MOV technique should be used when the cuff has been deflated. Air is gradually inserted at 0.2 – 0.5 ml increments with a 10ml syringe into the tracheostomy tube cuff. A stethoscope should be applied to just below the thyroid cartilage and listen for any air leaks (this is particularly audible in positive pressure ventilation). This is usually a two-person technique. The volume of air inserted should be noted in the patient’s case notes. Minimal occlusion volume techniques can be used as an alternative to using cuff pressure manometer. Oral hygiene is part of basic patient care and it is important that this should continue to be performed as required. Oral toileting refers to the removal of saliva, bile or other foodstuffs, which may collect above the cuff. On deflation, if the patient has an inadequate cough the debris may enter the bronchus (Dikeman and Kazzandjian 1995). These can be removed safely by using a synchronised suction/cuff deflation technique undertaken by 2 practitioners.